Rumor has it that Nintendo will be launching the 3DS as it launched the Wii - in December, with absolutely no launch supply. Hey, have you heard about that 3DS thing? It's made quite the splash since its debut at this year's E3, but now people have two unanswered questions - when is it coming out, and how much will it cost? Well, some analysts have forecast prices in the $250 range for the latter (though it's still unconfirmed), and for the former? Who knows! Well, perhaps somebody knows - a source told CVG that the device would be hitting the UK (and presumably the US and Europe as well) in December, just in time for the holiday season. Marketing and hype will begin around the end of October, and initial supply of the undoubtedly hotly-anticipated handheld will be "limited." If that sounds suspiciously like the launch of a certain other Nintendo console to you, don't worry, you aren't going crazy. According to CVG's source, "[The] launch is going to emulate Wii in December ... We've been informed that Nintendo wanted a long run-up to Christmas, but now it's going to be a close-run thing. We're not expecting a lot of stock before next year." The Wii launched in the US and Japan in November 2006, but wasn't out in the UK and Europe until early December '06. 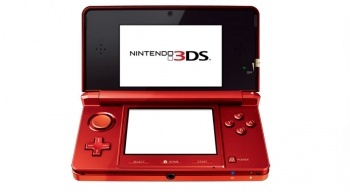 Nintendo plans to have the 3DS out everywhere by March 31st, 2011, but obviously a holiday launch would be preferred. The Wii's 2006 holiday launch did very well for the hardware giant, as the little white box quickly became one of the most must-have gifts of the season. But if the 3DS' launch is anything like the Wii's, then most people shouldn't plan on being able to get their hands on one until oh, mid-2011. As always, this is a rumor, and a Nintendo representative said as much: "Any dates currently being discussed are pure rumor and speculation as we have not confirmed any specific dates publicly." So, this could all be wrong. Maybe the 3DS will come out in November. Maybe it'll be out in January. Maybe Nintendo will have enough freakin' supply for once! Okay, probably not that last one.